The term Virtual Person refers to a conversational program equipped with graphical representation of its 3-dimensional human body. The term Virtual Person is typically used by graphic designers who deal with modelling the virtual human body. Some businesses use it as a synonym for chatbot. A typical example of a Virtual Person is a boy called Milo. He recognises facial expressions and emotions of his interlocutor and re-enacts these accordingly. The video is a demonstration of a Milo’s ground breaking technology created by a computer game designer Peter Molyneux and his team over at Lionhead Studios. A digital artist Stefan Fahrngruber focuses on experimental video and animation, interactive installations, sculptures, robots and interfaces, which have the core topic of interaction and communications with the computer and the effects of digital media on human behaviour. In his gallery you can also view some examples of a photo-realistic Virtual Person, one of which is presented in the picture. Virtual world communities such as Second Life, Teen Second Life and IMVU, provide generators where a user can make his own Virtual Person. These generators allow the user to personalize physical appearance and wardrobe of his Virtual Person. Before trying a generator, read this article How to Create Your Own Virtual Person in a Virtual World where journalist Jennifer Williams provides instructions on how to create a Virtual Person for a chosen virtual world. Creating a Virtual Person is a very complex and interesting process, as exemplified by the picture below. 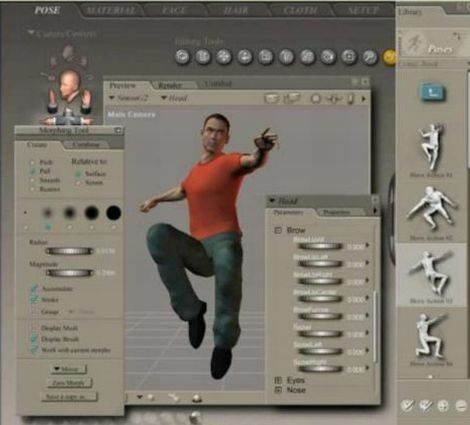 Analyze the Virtual Person photo gallery and view several representations of features to create Virtual Persons as similar as possible to real humans. Some tools also provide the option to enhance existing pictures of people. Another tool that helps you create a recognizable but anonymous presence for online activity is DAZ 3D released by Daz Productions. Follow these simple steps on How to Create a Virtual Person with DAZ, prepared by Dave Ward. The term Virtual Person is a composite of two words: virtual and person. The word virtual has been used since late XIV century as “influencing by physical virtues or capabilities” from Latin virtualis, virtus - “excellence, potency, efficacy”. The meaning of “being something in essence or fact, though not in name” is first recorded in 1650s, probably via sense of “capable of producing a certain effect”. Computer sense of “not physically existing but made to appear by software” is attested from 1959. The word person originates from early XIII century, from old French persone - “human being” (XII century French personne), from Latin persona - “human being,” originally “character in a drama, mask,” possibly borrowed from Etruscan phersu - “mask.” This may be related to Greek Persephone. The use of -person to replace- man in compounds and avoid alleged sexist connotations is first recorded 1971 (in chairperson). In person meaning “by bodily presence” dates back to from 1560s.Person-to-person is first recorded 1919, originally of telephone calls. The first appearance of the term Virtual Person was connected with the notion of virtual worlds present on the Internet late 1990s. Although we use chatbot as the main synonym on this website, please do not be confused. There are more than 161 synonyms in use by academics, business and virtual person enthusiasts! It is simply a matter of reading between the lines. Please check out our main directory with 1376 live virtual person examples (an overview as maintained by developers themselves), our vendor listing with 256 virtual person companies and virtual person news section with already more than 370 articles! Our research tab contains lots of papers on virtual persons, 1,166 journals on virtual persons and 390 books on virtual persons. This research section also shows which universities are active in the virtual person field, indicates which publishers are publishing journals on humanlike conversational AI and informs about academic events on virtual persons. Also, check out our dedicated tab for awards, contest and games related to the virtual person field, various forums like our AI forum by virtual person enthusiasts and add any virtual person as created by yourself and your colleagues to our virtual person directory. Please do not forget to register to join us in these exciting times. Occasionally a Virtual Person works at a point of sale. Imagine an extra person who can stand and talk directly to a specific audience for hours without a break. Watch this video prepared by marketing services provider W7 how a holographic projection of a Virtual Person attracted customers. Alternative meaning of a term Virtual Person is often used by entrepreneurs referring to people assisting others remotely, via Internet. Soon, lawyers may need to create a new legal fiction by the name of “the Virtual Person”. Virtual Person would be an identity legally representing a physical person on the Internet.